Enrico San Juan, my friend wrote. The war on drugs is very much on the table in the present administration’s future goals just like in the first State of the Nation Address (SONA) of President Rody Duterte. Like what PRRD has been emphasizing, that the illegal drug flourished during the past administrations and international drug trafficking is very much active due to the advance technology via the internet. Given the fast electronic money transfer, undetected, and using various ways of transporting illegal drugs across borders and continents, winning the war against this menace is farfetched. More cooperation from other countries near and far, using the latest technology on how to catch the drug traffickers are very much needed. New out of the box strategies and policy should be the immediate agenda of our national security to preempt other nations agenda of like 'Greek bearing gifts' and a perceived involvement in indirect 'state sponsored' narco operation. After the self-imposed deadline of the Philippine National Police to end the drug problem in December 2016, the current leadership told the nation that the drug problem is so enormous and that they needed more time and resources. But the hanging question remains, mostly from the netizens (and ordinary people sans the internet), where are the ‘big fish’ and the so-called Chinese drug lords? Who are the importers of billions of Shabu that even passes the customs Greenlane caught unnoticed? It’s always the petty drug users and pushers ‘in slippers’ that are caught and presented in the media (if they are still alive). From “Meth gangs of China play star role in Philippines drug crisis” by John Chalmers published @reuters : The arrest of Hong, who has pleaded not guilty, added to the ranks of Chinese nationals seized in the Philippines on narcotics charges. Of 77 foreign nationals arrested for meth-related drug offenses between January 2015 and mid-August 2016, nearly two-thirds were mainland Chinese and almost a quarter were Taiwanese or Hong Kong residents, according to the Philippine Drug Enforcement Agency (PDEA). Remember Lim Seng, the mainland Chinese chemist for opium operation branded by Marcos as drug lord whose real boss was Siochi, a Binondo based drug lord and money launderer, friends of top level people during FM time as per record of CANU( Constabulary Anti-Narcotics Unit). The pattern of operation was just modified but the 'signature' is still there. Known in the trade as “cooks” and “chemists,” meth production experts are flown into the Philippines from Greater China by drug syndicates to work at labs like the one caught at Mount Arayat. Thanks to foreign agents. China isn’t only a source of meth expertise – it is also the biggest source of the meth and of the precursor chemicals used to produce the synthetic drug that are being smuggled into the Philippines, especially via Sulu and other parts of the country, according to local drug enforcement officials. “It’s safe to say that the majority of the meth we have comes from China,” said PDEA spokesman Derrick Carreon. China’s dominant role in the Philippine meth trade has not dissuaded President Duterte from cozying up to Beijing, even as he declares drugs to be his country’s greatest scourge. Duterte is waging a brutal anti-narcotics campaign that has killed more than 2,000 people and led to the arrest of more than 38,000. Police are investigating some 3,000 more deaths.” And yet President Duterte announced the intention of China to help in the war against drugs. Duh? Comes the Chinese-sponsored One Belt One Road initiative. Could this be another soft power op to take the world for a ride? Just asking. But what is in stake for the nations in the OBOR? “China’s planned pan-Asia railway network, reaching from Kunming in the north to Singapore in the south, is a signature project in Beijing’s One Belt One Road (Obor) initiative. The economic benefits, if the 3,900 km network connecting all mainland Southeast Asian states with the Middle Kingdom goes forth as planned, could be enormous. There may also be troublesome aspects to countenance too, however: namely an increase in cross-border drug trafficking. Infrastructure upgrades facilitate the exchange of people, goods, and culture. Yet they can also empower criminals seeking easier and speedier access to new destinations. Transporting illicit drugs via high-speed rail is nothing new. The Taiwan High Speed Rail line that runs the length of the island’s west coast is an established pipeline for drug runners. In China, arrests of drug traffickers on its high-speed rail system are not uncommon. One of the latest and most curious cases involved a Chinese smuggler returning from Myanmar with a batch of hollowed-out dragon fruits containing 1,031.28 grams of methamphetamine tablets. The planned network is currently only moving ahead on the central sections connecting Kunming, Laos, Thailand, Malaysia, and Singapore, with regional geopolitics stalling the eastern and western routes. Given its reach, this line is the most crucial, however. The country that stands to benefit most is the landlocked, impoverished nation of Laos. An upland nation of 6.5 million people, currently, it has a very meager railway. With the central line in place, its leaders hope to make it a land-linked regional transit center. Construction officially commenced in December 2016 for the Laotian portion of the line. Running from the China-Laos border to the capital, Vientiane, the route’s total length is 414 km, with bridges and tunnels comprising 62% of a line that traverses rough mountainous terrain. International narcotics intelligence believe that High-speed rail suits individual drug runners perfectly, with passengers typically allowed 40 kg of luggage per person. At present, traveling from northern Laos to Bangkok takes close to 30 hours by automobile, and even longer during the rainy season. The Luang Namtha to Vientiane drive can be exceptionally draining due to the terrain. But with high-speed rail, a run from northern Laos to Bangkok will easily be reduced to a comfortable five to seven hours. Laos is the focus here because it is the starting point of the Southeast Asian drug trade. The recent arrests of prominent Laotian drug lords confirmed the rising status of Laotian nationals as leader players in the regional trafficking web. Is this the prize we have to pay to be linked in the rail system that will bring about more drugs and more deaths? In the end, who benefits? POLAND was the big success story of Europe after 1989. Its peaceful transition from communism, culminating in membership of the European Union in 2004, was an example for countries farther east to emulate. But recently, it has been backsliding. Since coming to power in 2015, the right-wing Law and Justice party (PiS in Polish) has been weakening democratic checks and balances. PiS has followed in the footsteps of Viktor Orban, the Hungarian prime minister, whom its leader openly admires. Brussels has struggled to respond effectively. Yet Poland is too big to lose: it is a frontline country on NATO’s eastern edge and will be the EU’s seventh-largest economy after Brexit. What is PiS doing? PiS came to power promising change after eight years in opposition. Shortly before the elections, Jaroslaw Kaczynski, its divisive leader, called for “a reconstruction of the state”. In practice, that has meant subordinating it to PiS. The party has used its majority in parliament to push through controversial laws, though it does not have enough seats to formally change the constitution. The prime minister, Beata Szydlo, has little clout. From PiS’s headquarters in Warsaw, Mr Kaczynski pulls the strings. Democrats at home and abroad are alarmed. In towns across Poland, tens of thousands of protesters have taken to the street demanding “free courts”. Officials in Washington and Brussels are worried, too. The European Commission has warned that it is “very close” to triggering Article 7 of the Lisbon Treaty, paving the way for sanctions on Poland (though Mr Orban would probably block them). 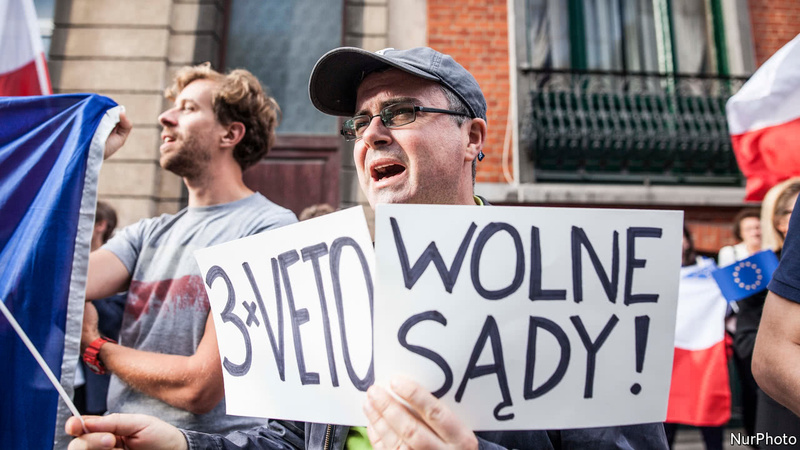 On July 24th Andrzej Duda, Poland’s president, said that he would veto the law on the Supreme Court, suggesting that the protests have worked. Yet PiS does not give up easily. The precise nature of his veto is also unclear. Even if the centrist opposition wins the next elections, due in 2019, the damage to Poland’s institutions could take years to reverse. Meanwhile, Poland may set a dangerous precedent, emboldening illiberal leaders in Europe and beyond. The Polish and Hungarian cases suggest that the EU can do little to enforce democracy in countries that are already members. The latest changes push Poland “backwards and eastwards”, said Donald Tusk, the president of the European Council, and the country’s prime minister from 2007 to 2014, in a statement last week. If democracy in Poland unravels, it will be felt around the world. Autocrats, from Moscow through Ankara and beyond, will rejoice. 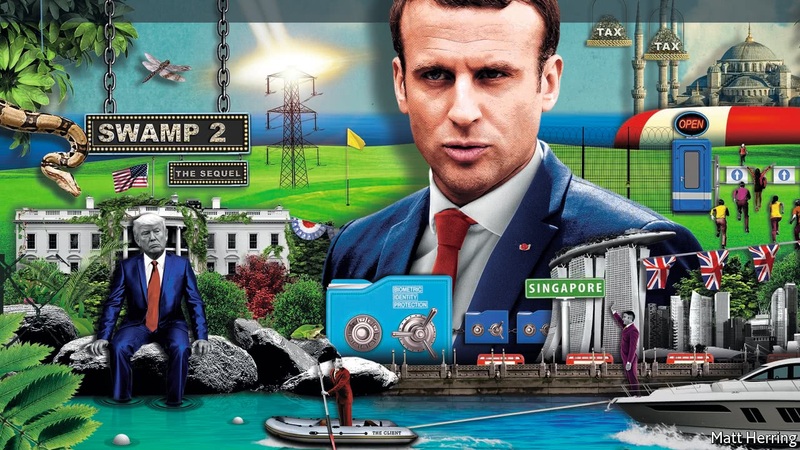 BREXIT, President Donald Trump, President Emmanuel Macron: in Western politics, at least, it has been a time to expect the unexpected. Seemingly far-fetched developments turn out to be the new reality the world must to adjust to. Our own fanciful imagining of the first 100 days of a Trump presidency, published a year ago in The World If, our annual collection of scenarios, proved in parts to be uncannily close to what actually transpired, especially its speculation that Russian hacking of Hillary Clinton’s e-mails might have helped to swing the 2016 election. So it would be tempting to suggest that readers should search our latest batch of hypothetical conjecture for signs of the next surprises about to upend conventional wisdom. Yet the point of asking “what if” questions is not to make predictions. It is to stretch thinking. Predictions are rightly constrained by a sense of probabilities; scenarios can leap enjoyably beyond that, to explore all sorts of possibilities. Scenarios come in a number of different flavours. One variety imagines something that has no chance of actually happening but which nevertheless throws intriguing light on the world and ways to think about it. For example, countries around the globe are not about to open their borders to allow unlimited numbers of people from poor places to work in rich ones (if anything, they are tightening border controls). But what if they did? A policy that could make the world twice as rich as it is surely merits closer examination (see article). Similarly, there is no prospect of governments simply disappearing—but if they did, would an end to their role in redistribution result in greater income inequality? The answer, argues Sir Angus Deaton, an eminent economist, is not as simple as you might think (see article). A third type deals with big developments that may be quite probable, though few people yet realise this. Technological upheaval is typically in this category. It is hard to get one’s mind around “blockchains”, the system behind bitcoin, a digital currency. But what if blockchain technology ran the world? Enthusiasts think it has the potential to disrupt one of the biggest but least noticed industries: the trust business (see article). In which of these categories does our scenario of a second-term Trump belong? America’s president is typically hard to pin down. A case could be made that he straddles all three (see article). Some of this speculation can be deadly serious (imagine America’s electricity grid being knocked out—see article), but escaping reality can also be fun. In what-if mode, you can indulge in historical counterfactuals: what if the Ottoman empire had survived? (See article.) You can speculate wildly: what if people could control the weather? You can play with numbers: what if everyone lived to be 100, or if every country’s roads were as safe as Sweden’s? Such questions lend themselves to idle holiday-season musing. Yet the musing can be refreshingly mind-stretching. BRITAIN’S fishing industry is a tiddler, contributing less than 0.1% of GDP. But the island nation has great affection for its fleet. During last year’s Brexit referendum campaign, a flotilla of trawlermen steamed up the Thames to protest against European Union fishing quotas. On July 2nd Michael Gove, the Brexiteer environment secretary (who claims that his father’s Aberdeen fish business was sunk by EU rules), announced that Britain would “take back control” of its waters by unilaterally withdrawing from an international fishing treaty. Gutting such agreements is strongly supported by coastal communities. The pro-Brexit press cheered Mr Gove’s bold announcement. But landing a new deal for British fishermen will be legally complex, expensive to enforce, oblige Britain to observe European rules that it has had no hand in setting and, most likely, leave its businesses and consumers worse off than before. It is, in other words, a case study of the Brexit negotiations as a whole. The EU’s Common Fisheries Policy (CFP) was drawn up before Britain joined, to its disadvantage. But membership has allowed Britain to improve the policy. Countries’ quotas are now set on a basis that is more scientific than political. Unwanted fish can no longer be discarded at sea, which has helped to reverse the depletion of stocks. Unpicking decades of tangled legal agreements will be harder than it looks. Mr Gove has initiated Britain’s withdrawal from the London Fisheries Convention. But Michel Barnier, the European Commission’s Brexit negotiator, argues that this 1964 agreement has since been superseded by the CFP. Regardless of these conventions, foreign fishermen may claim historic fishing rights going back decades or even centuries. Many of them have set up units in Britain to buy quotas from British fishermen. Unless the government overturns these property rights by decree, it may face a large compensation bill. In any case, Britain will find that, unless it is willing to continue sharing access to its waters, it will lose access to valuable foreign markets. Consider Norway, which as a non-EU member has control of its own waters. It nonetheless co-operates with the EU and other countries over fish quotas in 90% of them, in order to maintain its own fishermen’s access to fisheries inside the EU. Of the 700,000 tonnes of fish landed in Britain each year, some 500,000 is exported, two-thirds of it to the EU. Without a mutual deal, which would surely include giving European fishermen some access to British waters, those exports would face World Trade Organisation tariffs of 12%. In the past the EU has responded to fishing disputes with Norway and the Faroe islands by banning all imports. British fishermen would soon find that, to borrow a phrase from the Brexiteers, “we need them more than they need us”. Consumers would notice, too, since most of the fish on British dinner plates is imported. A third of it comes from the EU, and British fishermen net about a sixth of their total catch in French, Belgian, Dutch, Danish or Irish waters. Britons may decide that they are willing to pay higher prices for the privilege of banning foreign vessels from British waters. But such a rule would have to be enforced, at extra cost. The “cod wars” with Iceland in the 1950s-70s saw gunboats deployed to protect fisheries. Some Brexiteers would doubtless enjoy such a muscular exertion of sovereignty. But for ordinary Britons who, since the referendum, have endured a squeeze on incomes comparable to that during the financial crisis of 2008, the fishing industry is a red herring. The aviation business is bracing for a hard exit. The finance industry, which contributes 7% of GDP, is in danger of decamping. Britain’s Brexit negotiators have bigger fish to fry. 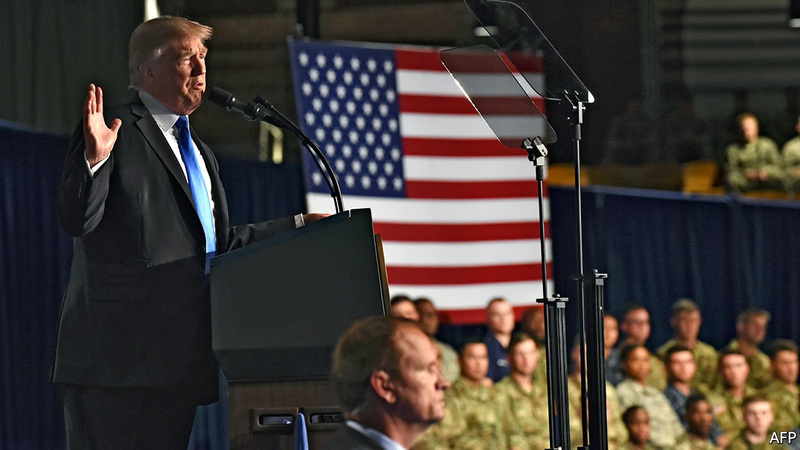 Since the beginning of 2015, when NATO ended its combat mission and handed full responsibility Afghanistan’s security to its ill-prepared forces, the Taliban insurgency has grown in strength. According to a report earlier this year by SIGAR (the Special Inspector General for Afghanistan Reconstruction, a post created by Congress), the proportion of the country under uncontested government control had fallen during the 12 months to November 2016 from 72% to 57%. The attrition of Afghan security forces, say American commanders, is occurring at an unsustainable rate. In the year to November, 6,785 Afghan troops were killed and another 11,777 wounded. The Afghan National Security Forces have 370,000 troops and police. Between 2015 and 2016, 19 Americans were killed in action. Mr Obama had hoped to pull out even the remaining 8,400 American military trainers and advisers before he left office, but eventually he decided to leave that decision to his successor. The restrictions on INGOs come as Turkey still reels from the aftermath of the coup attempt last July, which has seen a purge 140,000 Turks from government jobs, the arrest of nearly 50,000, and a state of emergency which enables closing any NGO without reason. The public vilification of INGOs intensified after the coup attempt. For example, the pro-government Sabah newspaper last August ran a story with the headline, “Foreign NGOs are fanning the flames of chaos.” It claimed that aid agencies crossed into Syria with “bags” of money to fund and divide Syrian opposition groups. This March, Sabah claimed INGOs were funneling cash to the outlawed Kurdistan Workers’ Party (PKK) in Syria from Hatay province, with the assistance of cadres of Fethullah Gulen – the US-based cleric whom Turkey accuses of ordering last year’s coup attempt. “The aid agencies in Hatay are full of spies,” ran Sabah’s headline. The story claimed that INGOs were not trying to help people, but lay the groundwork for civil war in Turkey. “It’s not that they hate foreigners, but they worry about foreigners. They think that everyone is not doing good for Turkey,” says the Syrian who works with the aid community. The rules for work permits for Syrian staff have become clearer, he says, but weeks ago one local Syrian NGO delivering food applied for 30 work permits, and got only two. Shutting down the INGOs and raising pressure on others has shaken the relief community, which senior Western relief workers say grew too fast the first years of the conflict, with uncommonly large US and EU-funded budgets applied in chaotic situations. Turkish officials and media have been given grist for complaint by the US Agency for International Development’s Office of the Inspector General (OIG). Since 2015 it has been investigating alleged fraud schemes that involve “bid rigging, collusion, bribery, and kickbacks,” which have led to the suspension of $239 million in program funds among four NGOs in southeast Turkey, according to OIG data released March 31. Three of those were identified as big players global organizations – IMC, the International Rescue Committee, and the Irish group Goal – in a May 2016 investigation by IRIN, a media venture once run by the UN that focuses on the relief world. IRIN noted that all three INGOs grew quickly as the Syria crisis took off. IMC funding more than doubled, for example, to $232 million, from 2011/2012 to 2014/2015. Goal’s funding for Syria leapt 94 percent from 2013 to 2014. Those increases mirror similar expansion by the UN, which saw the value of goods and services procured in Turkey alone jump from $90 million in 2012 to $339 million in 2014, reports IRIN. The impact is sizeable: Though the Inspector General’s office says that just one IMC staff member lost their job, IRIN reports that 800 people “involved in IMC contracts in Turkey” were let go because of the USAID aid suspension. “NGOs tend to think that we have this irrefutable positive impact,” says the senior Western aid worker in Gaziantep. Turks are “looking at what they see as a security threat in all these foreigners around, who maybe were or maybe were not spies, maybe were having an impact, maybe weren’t following the rules, maybe were helping the enemy,” says the aid worker.